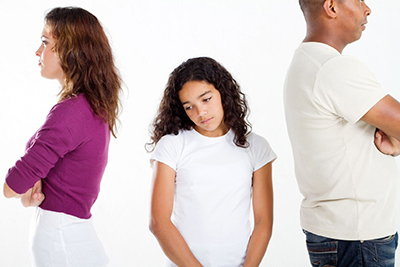 Do you feel caught in the middle of your parents' problems? Ask you to carry messages. Ask you to give them information about the other parent. Ask you to keep secrets from the other parent. Expect you to listen to them saying mean things about the other parent, or blaming the other parent for everything that has happened. Try to make you take sides, or choose one parent over the other. Tell your parents how you feel. They might not realize what they are doing, and once they do, they might stop. Say you would rather not carry messages, or spy on the other parent. If parents want to tell each other something, they should do it themselves. If a parent wants information, they should simply ask the other parent. Say you don't want to hear them complaining about each other, because it hurts you. Tell them they need to work out their problems themselves. It's not your job. Tell them you love them both, and you will not choose one over the other. Don't get involved in your parents' arguments. If they are arguing in front of you, walk away. If it's too hard for you to say things like this directly to your parents, try writing them in a letter. It’s helpful to be able to talk to your parents about your feelings and to be clear about your needs. It may be hard, but communicating with them will help you face the changes and challenges that lie ahead.